Paklay to some part of Visaya is a dish where the vegetable or meat ingredients are cut into strips, like pinaklay na tambo (bamboo shoot cut into strips) this I have learned lately. The Paklay of Cebu and some parts of Mindanao is made up of beef, goat or pork innards usually tripe, liver and heart, sautéed and cooked with ginger and chilies. Strips of vegetables like bell pepper, carrots ect. are added to give a contrasting color besides flavor. And of course bamboo shoot, but I have seen or eaten paklay with out it. 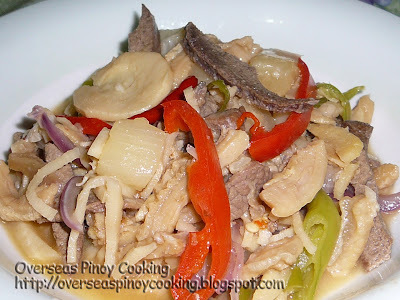 The dish is similar to papaitan of the Ilocanos but with out the bile and usually with out the broth also. On some versions they add atsuate or annatto extract for the vibrant orangey color. This is my second version of paklay, my first paklay, click here to see that post is made up of pork innards with little broth. My second version I used beef tripe and liver but nearly dry. Here is how I made my “Cebu Paklay” enjoy. In a saucepan sauté garlic, ginger and onion. Add in beef meat, beef tripe, liver (and heart if using), pineapple, bamboo shoot, and fish sauce stir cook for 3 to 5 minutes. Now add in 2 cups of broth (from boiling the beef tripe) and sampalok sinigang mix if using, bring to a boil and simmer for 8 to 10 minutes or until most of the broth has evaporated. Add in siling labuyo, siling haba, bell pepper and season with salt and pepper to taste, cook for another 2 to 3 minutes. Serve hot. I love this! My grandma is from the Philippines and she loves cooking paklay. It is so delicious! penge paklay! sarap! care to xlinks? nasa blogroll na kita! more power! Hi punky, thanks for the link, nice site. Thnx for the recipe!I u want to share ur experiences - go to Yummy Cebu, a food blogging platform!